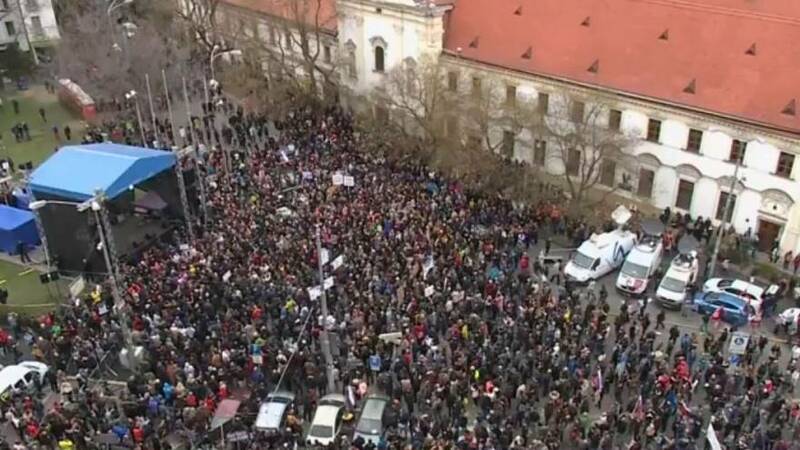 Anti-government protests have taken place in several cities in Slovakia, with protesters demanding new elections, and an independent investigation into the death of a journalist. Tens of thousands took to the streets on Thursday, in one of the biggest demonstrations since the protests that forced the prime minister to resign last month. There are concerns that the level of corruption in the country is worse than previously thought. Protesters called for the resignation of police chief Tibor Gaspar, and for the law to be changed to prevent the interior minister from naming his successor. This, they believe, might ensure an impartial investigation into the journalist's killing. No-one has been charged with the murder of Jan Kuciak and his fiancée Martina Kusnirova, both 27, who were shot in the head at their home outside Bratislava in February. Kuciak had investigated the alleged misuse of European Union funds – which have boosted Slovakia’s economic development but also the amount of cash in circulation. Police believe the journalist was murdered in a contract killing related to his reporting. Kusiak also probed suspected tax fraud, sometimes by people with links to the ruling Smer party. He also reported on deals between the government and the country's biggest privately-owned security firm, whose owner is related to the police chief. Gaspar has denied wrongdoing. Thousands took to the streets after the couple's murder and ultimately forced former prime minister Robert Fico and his interior minister Robert Kalinak out of office. Kalinak - who appointed Gaspar and was also the subject of articles by Kuciak - also denies wrongdoing. Before his death, Kuciak was investigating Italian businessmen with suspected mafia links, one of whom had had business dealings with two people who worked in Fico's office before resigning in the wake of the murder. The pair deny any links to the killing. There is now discontent among protesters over measures taken by the new Prime Minister Peter Pellegrini - Fico's former deputy - and in particular with the new Interior Minister, Tomas Drucker. Rallies have been scheduled on Thursday and Friday under the slogan "For A Decent Slovakia". The protest in the capital took place on Thursday as the main square was already booked for the following day.